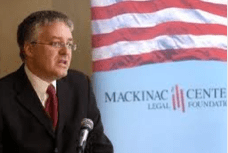 MIDLAND, MICHIGAN — Mackinac Center Legal Foundation Director Patrick J. Wright filed a motion today before the Michigan Employment Relations Commission seeking to prevent graduate student research assistants at the University of Michigan from being unionized as public employees. The motion was filed on behalf of Melinda Day, a graduate research assistant at U of M’s Molecular, Cellular and Developmental Biology Department. MERC’s earlier ruling came in 1981 in response to a petition by the Graduate Employees Organization — the same union applying to MERC now — to organize the University of Michigan’s graduate student research assistants. In that case, which now serves as legal precedent, MERC denied the GEO’s petition and concluded that the students were not public employees. The GEO has not attempted to show that MERC’s ruling was flawed. If the unionization were approved, the union would more than double its membership and more than double its dues to over $1 million annually, according to the Foundation’s estimates. “Typically, the employer would object here, but the regents’ 6-2 vote in May favoring union supporters meant that our client’s legal rights were now at risk,” Wright said.